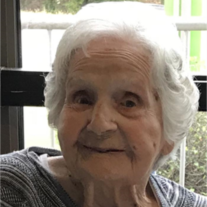 Lucy Juanita Brigman Sanders, 99, wife of the late Robert Manley Sanders, of Seneca, passed away Saturday, March 16, 2019, at GHS Lila Doyle. A native of Cheraw, SC, Mrs. Sanders was the daughter of the late John L. and Isadora Stubbs Brigman. She was a seamstress at Jantzen and a member of Saint Mark United Methodist Church. Mrs. Sanders is survived by her sons: John R. Sanders (Carolyn) of Matthews, NC, Charles H. Sanders (Becki) of Piedmont, SC, and Otis Jerald “Jerry” Sanders (Sandra) of Dunwoody, GA; seven grandchildren, eleven great grandchildren, and five great-great grandchildren; and a niece: Carolyn Brigman Jackson. In addition to her husband and parents, Mrs. Sanders was preceded in death by a brother: Otis Brigman; and grandson: Charles “Pedie” Sanders. Funeral services will be conducted at 2:00 PM, Wednesday, March 20, 2019 at Davenport Funeral Home Chapel. The family will receive friends from 1:00 – 2:00 PM, Wednesday, March 20, 2019, prior to the service, at Davenport Funeral Home. Graveside services will be held at 11:00 AM, Thursday, March 21, 2019 at Pleasant Grove United Methodist Church, Cheraw, SC. In lieu of flowers, memorials may be made to the Caring Ministry at Saint Mark United Methodist Church, 616 Quincy Rd., Seneca, SC 29678; or the Pleasant Grove United Methodist Church Cemetery Fund, 3360 Chesterfield Hwy., Cheraw, SC 29520. The family expresses sincere thanks to the staff of Lila Doyle for the love and care rendered and her many church members and friends who have visited and wished her well over the years. Davenport Funeral Home of Seneca, SC and Miller-Rivers-Caulder Funeral Home of Chesterfield, SC are serving the Sanders family.